Kent Holland practices construction law in Tysons Corner, Virginia. He manages a national practice (formerly with Wickwire Gavin, P.C. and now with Construction Risk Counsel, PLLC) representing design professionals, contractors and project owners. He is founder and president of a consulting firm, ConstructionRisk, LLC, providing consulting services to owners, design professionals, contractors and attorneys on construction projects. He is publisher of ConstructionRisk.com Report and may be reached at Kent@ConstructionRisk.com or by calling 703-623-1932. This article is published in ConstructionRisk.com Report, Vol. 17, No. 6 (September 2015). “Working on Purpose,” (Ardent Publications, 2011). “Risk Management for Design Professionals in a World of Change,” (Ardent Publications, 2010). “Construction Law & Risk Management – Case Notes and Articles, Vol. II.” (Ardent Publications, 2006). “Construction Law & Risk Management – Case Notes and Articles, Vol. I.” (Ardent Publications, 2003). “The Winning Way – A Spiritual Journey to a Life of Success and Significance,” (Ardent Publications, 2003). “Architectural/Engineering Contract Guide,” (American Consulting Engineering Council, Washington, D.C. 1999). “Construction Contractors’ Environmental Risk Management Procedures Manual,” Associated General Contractors of America , Washington , D.C. 1994)(co-author and editor). 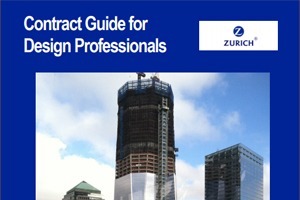 “Architectural/Engineering Contracts: Risk Management Guide (Zurich Insurance, New York, NY, 1997/1998). “Dealing with Hazardous Waste and Environmental Issues,” Design Professionals Handbook, Chapter 26, (John Wiley & Sons, 1991). Approximately 20 or more risk management workshops per year for design professional firms throughout the country. “Year in Review – Design Professional Litigation,” ACEC Legal Counsel Forum Meeting in Washington, D.C. for 2009, 2010, and 2011. Also taught as ACEC webinar each year. “Design-Build Construction for the U.S. National Guard,” DBIA certification course (November 2007, Key West, FL). “50 Legal Concepts Every Engineer Should Know,” ACEC seminar (November 2007 – San Francisco, CA). “Construction Defects: Finding Insurance Coverage,” American College of Mortgage Attorney (October 2007 – Aspen, CO). “Why Should I Pay for Your Mistakes? Indemnification: Addressing the Contract Language Details,” ABA Forum on the Construction Industry (Oct 12, 2006 Scottsdale). “Environmental Risk and Insurance,” seminar presented with Arthur J. Gallagher & Co., (Chicago , IL – March 15, 2004). “Risk Management and Insurance for Design Professionals,” presented at International Risk Management Institute 23rd IRMI Construction Risk Conference (Chicago , IL – Nov 18, 2003). “Design Professional Risk Management Workshop,” ConstructionRisk.com presentation (New York , NY – Oct. 16, 2003). “Design-Build: Current Issues,” panel moderator for DBIA Annual Meeting ( Orlando , FL – October 9, 2003). “Environmental Risk Management and Insurance,” presented for State Capital Law Firm Group, Annual Meeting (Boston , MA – October 3, 2003). “Risk Management for the Design Professional,” two and three hour workshops presented on a regional basis throughout the year by ConstructionRisk.com, LLC and Arch Insurance Group. “Design Professionals’ Risk Management,” presented for the Buffalo chapter of the New York State Professional Engineers Society ( Buffalo , NY – Dec. 2002). “Land Surveyors Risk Management,” presented at Michigan Land Surveyors annual conference, ( Grand Rapids , MI – February, 2002). “Search For Money: Insurance Perspective,” ABA Forum on the Construction Industry annual meeting program entitled “Guess Who’s Coming to Town? Stadiums, Arenas, Malls and More,” New Orleans , Louisiana (April 26-28, 2001). “Design-Build Project Delivery: Legal & Insurance Challenges,” DBIA Southeast Chapter Meeting, (Atlanta , GA , May 17, 2001). “Design-Build Contracting and Risk Management,” DBIA educational seminar (Denver , CO, June 29, 2001). “E-Commerce in Insurance & Construction,” 20thth Annual Construction Insurance Conference,” International Risk Management Institute, 2000. ConstructionRisk.com Report. Legal newsletter published monthly by ConstructionRisk.com, LLC, authored and edited by Kent Holland since April, 1999. Architectural/Engineering Briefings. Legal newsletter published quarterly by Zurich North America Insurance, authored from 1995 through 2002. “Design-Build on Environmental Remediation Projects,” Construction Risk Management Manual by IRMI (October 1997). “The Jonah Perspective on Construction Defects: A View From Inside the Fish,” Federation of Defense & Corporate Counsel Quarterly, (Vol. 53, No. 4, Summer, 2003).